Michael, Susan, and I attended the CASE Social Media Conference in Chicago last month. It was a great conference and recaps and resource lists have been compiled to share key take-aways with the rest of higher education. But, what is next? Everyone at #casesmc felt the energy and excitement around using social media in higher education. The faculty helped us think about evaluating our efforts in new ways and backchannel conversations carried on for at least a week after the conference ended. I know I’m not the only one who has a #casesmc search still running in TweetDeck! This post is for the attendees who are looking to further their professional development with other conferences, want to add new blogs to their Google Reader, and hope to keep the conversation alive. I’ve compiled a list of some of my favorite #highered resources and linked to a number of thought-leader’s twitter accounts. And please feel free to add your favorite resource by leaving a comment below! Higher Ed Live is a weekly web show network focused exclusively on higher education. Currently there are three shows: Student Affairs Live, Admissions Live, and Higher Ed Live. The guests are top-notch and the hosts do a great job leading the conversation. Bonus? The blog is just as informative as the weekly shows. EDUniverse is a hub where education professionals can find inspiration, share solutions, and build their networks. Some of the featured topics include social media, video, marketing, and design. And anyone can create a profile and upload content to the site. Full disclosure: mStoner designed, built and maintains the site. But since launching in February, EDUniverse has quickly become the first place I check when I’m looking for new ideas. LINK is the journal of higher education web professionals maintained by the HighEdWeb association. (More on them later.) LINK has multiple content contributors from institutions across the nation and Canada, which means you’ll often hear two different sides. In fact, their newest feature ALL CAPS focuses on bringing differing opinions together on various topics. Device-iveness: Planning for devices presented by Doug Gapinksi in a March 2012 webinar hosted by mStoner. Note: recording and slides are available. HighEdWeb is an organization of web professionals working at institutions of (mostly) higher education. This conference is roughly 3 times larger than #casesmc with over 500 attendees and 5 or 6 tracks to select from at any given time. The national conference is in October and I highly recommend checking it out. 140cuse promises attendees that they’ll “leave with a fresh outlook on how the real time web can be used in your business and/or personal life to do something meaningful.” Unfortunately it overlapped with #casesmc this year, but check out the backchannel and see for yourself! Confab: The Content Strategy Conference focuses on talking and thinking about content strategy. What opportunities exist? How does content impact user experience on your site? And mStoner is hosting the conference’s first higher ed lounge! Confab is sold out for 2012, but keep it on your radar for next year. EDUCheckup is a video review of higher education websites hosted by Nick DeNardis. Nick scores sites on visual, information, and code. CASE Social Media blog is a great resource. Some #casesmc faculty and attendees regularly contribute content. Seth Godin’s blog tops this list. Simply put, he is insightful and thought-provoking. Six Pixels of Separation is Mitch Joel’s blog on the Twist Image site. There is a wealth of information and links to other resources here. Comscore is a great resource if you are looking for surveys and data to support your work. I find their monthly U.S. Online Video Rankings to be particularly helpful. Dribbble is an excellent resource for design inspiration. Designers from all industries contribute snippets of what they’re working on to the site. And it was recently pointed out to me that a quick search on responsive design brings up a number of interesting results. If I think of any more resources I’ll be sure to update this post. Disclaimer: people in higher education know how to have fun. RIP to the short-lived Wikipedia page. Follow the man, myth, and legend. I am stuck in a rut. Or, trapped by “The Dip” as Seth Godin calls it. You might have noticed that I am blogging and tweeting less frequently. (Or maybe you didn’t. Hey, you’re busy. I don’t expect you to keep tabs on me.) Lately I have felt like I have nothing to say. And I don’t just want to blog or tweet for the hell of it. I haven’t felt that creative spark in the last month that has driven my blog for the last year. (I was excited to see that I recently passed my one year blogging anniversary!) I am asking myself why? Why do I blog? What are my goals? What do I hope to give or gain from the experience? These are not questions that are easily answered right now. 1. I am reading more. I am trying to draw inspiration from books, blogs, tweets… inside higher education, outside higher education… anything! In fact, I just bought “The Dip” in hopes it will help me pull out. 2. I am choosing to tweet less. Right now it is about listening. And I don’t really care if that affects my Klout score. 3. I am writing this post. Because a friend told me a couple weeks ago that simply getting back in the habit of writing, even if it isn’t the most inspirational or fantastic writing I have ever done, can only lead to good things. 4. When a good idea strikes me, no matter the time of day, I am writing it down. And I will act on it. I have promised myself that. 5. I’m asking you for help. What do you do when you are stuck in a rut? What is social media all about? People use social media to connect, share, engage, laugh, cry, re-energize, discover, and so much more. Social media gives people a voice. So how do we use social media as a business? We remember that social media is the tool to connect and engage, but the key words are connect and engage. We identify that people talk to people, not logos or brands. We remember to act like people, to respond to people, to follow people, and to actually care about people. This summer Socialnomics updated their Social Media Revolution series for 2011. It is well worth your time to watch this video… and be amazed. Things always seem to happen when you least expect them, don’t they? Earlier this week I officially accepted an offer to work as a Marketing Manager for mStoner. There are no words to accurately describe how thrilled I am to be joining the mStoner team. I have respected the work they do and the resources they provide to higher ed for quite some time. This is an excellent opportunity for me to further develop my marketing skills and I am excited to continue to serve the higher education industry, just in a different way. I am grateful for all of the opportunities that have been given to me over the last three years of employment at Saint Michael’s College. I am privileged to have had the opportunity to start my professional career at an institution that I graduated from, respect and believe in. You can read the public announcement from mStoner here. Last month I was contacted by Mutual of Omaha to contribute my aha moment to their campaign. After some soul searching I realized that one of my biggest aha moments had to do with my career and #lovehighered. While the wonders of video editing cut out all reference to #lovehighered… I want to share my moment with you. It never hurts to remember why you do what you do everyday. What is your aha moment? Please share it below! I listen to music at work. I use Pandora so I can discover new music. I use Grooveshark so I can listen to music I already love. I have friends who have jobs that allow them to listen to music at work. 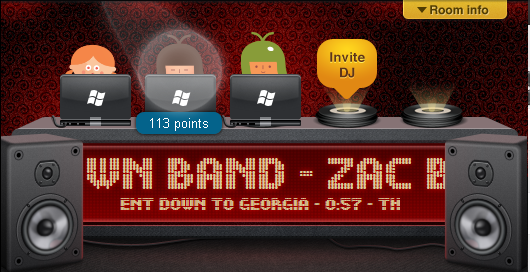 If you answered yes to three or more questions, turntable.fm is for you. This website has a very simple concept, yet it is truly a game changer. 1. Humans are creatures who crave connection and socialization with others. 2. People enjoy listening to music they already love. 3. Yet, people want to discover new music. By combining those three assumptions turntable has created a social experience around music. Each individual user curates their own DJ Queue from the turntable database or from uploading music you own. This satisfies assumption #2, you are ensuring that you will hear music that you already enjoy. Users enter either public or private rooms based around music genres, themes, affinity groups, anything! Up to 5 users can DJ in a room, but you will only see the songs in your list. This plays off assumption #3 as 4 out of 5 songs will not be your choice and you will not know what is going to be played ahead of time. There is a chat function that DJs and room listeners can use too. A lot of the conversation occurs around the music, especially in large public rooms. However, I like to use turntable to connect with colleagues and friends. The chat feature allows us to have real time conversation about what is going on in our day. Turntable has also incorporated a gaming feature into the platform. 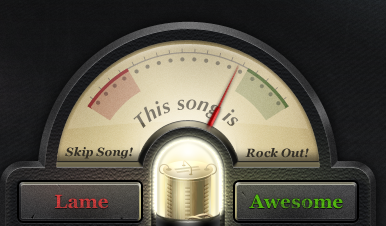 You get to vote whether you think the song playing is “awesome” or “lame.” The more “awesome” your song, the more points you receive too unlock new avatars. This gaming element was a brilliant move on turntable’s part. It keeps users interacting with the site. And personally I am gunning for the blingin’ gorilla. Turntable has completely revolutionized the work day. Turntable allows you to make connections. Turntable needs an app. The site loads on my iPhone but the music doesn’t come through the speakers. Plus it’s very clunky to navigate on such a tiny screen. Turntable could take a few cues from Grooveshark for song search and playlists. It isn’t always easy to search for songs within turntable because only 25 results appear and you can’t designate your search by song title or artist. You currently can not build playlists, so if you have uploaded or added hundreds of songs to your DJ Queue it can be tricky to find what you are looking for. Turntable needs to be open to the general public. Currently users can “get in” if they have a Facebook friend who is already using the site. While this probably creates an air of mystery and exclusivity (google wannabes), turntable has huge potential that will not be realized until more people start to use it. Everyone wants to be a DJ, but a room can only have 5 DJ’s at a time. Michael Fienen would like to see changes that would allow for better DJ rotation in busy rooms. His suggestions include a seat queue, DJ voting, or limitations based on song number or total play time. Fienen also points out that currently the avatars are pretty useless. You can’t customize them and “at the moment, they really are quite useless aside from indicating who has liked a song.” Since we connect with turntable through Facebook, one might expect that we should be able to use our Facebook profile photos in place of the avatar. Have you used turntable? How has it changed your music experience? Are there any other features you wish they would add? Last night I was given the honor to speak to the inductees of the National Honor Society and National Junior Honor Society at my high school alma mater, Chateaugay Central School. What do you say to a bunch of academically-driven high school students in only 10 minutes? How do you say it in a way that they’ll actually pay attention? Naturally I decided to talk about Facebook, throw in a Rebecca Black reference, and give them tips for applying to college. The theme of the speech was “by working hard you can achieve great things.” When the night was over I heard from numerous students and parents that this was one of the few speeches they actually listened too. That felt good. I decided to post the speech here for my readers to see, comment on, offer constructive criticism to. Who knows, maybe one day they’ll invite me to speak at Graduation. “Good evening everyone. I am honored to be speaking tonight at your Academic Awards ceremony and National Honors Society induction. So naturally I am going to start by talking to you about Facebook! How many of you have a Facebook Profile? Keep your hand raised if you have written on your friend’s wall or commented on their photos. Have you have “liked” a Page or joined a Facebook Group. And what about YouTube… How many of you have watched a video on YouTube? Look around the room. Nearly every student has their hand raised right now, or had it raised at some point in the last minute. When I was in high school, not a single one of those websites existed. Facebook launched right about the time I graduated from high school and YouTube was created during my freshman year in college. Why am I telling you this? Because if those sites didn’t exist and you hadn’t just raised your hand, I wouldn’t have a job right now. These companies, that are part of our everyday lives, did not exist when I was sitting here being inducted into National Honor Society 10 years ago. And, these companies were founded by teens and 20 something year olds. People who are not much older than you or I. In all of those hours you have spent social networking have you ever stopped to think that there are very real people, you are looking at one in fact, whose job is to leverage those sites and use them for marketing purposes? I go to work every day and immediately log into Facebook, sign on to Twitter, and pull up YouTube. I am tasked with creating content that will grab the attention of a high school student. I have a very cool job, right? Saint Michael’s College pays me to Facebook. But my job is more than just facebooking. Facebook might be the tool that I use, but my job is actually about understanding HOW you think, HOW you communicate, and WHAT is important to you. Think of it as the psychology of a high schooler. I need to be able to talk your language so that I can craft messages and videos that will get your attention. If you are singing Rebecca Black’s “Friday” – I better be singing it too. My job is to understand you. So here I am. Working online on websites that did not exist when I was your age. And it is very likely that you will one day work in a job that does not currently exist. It is really difficult to imagine that, isn’t it? How can you possibly prepare for something that doesn’t exist? The world is changing, faster than ever before. And you are expected to keep up with those changes. But how do you do it? The work that you are doing in the classroom today is molding you into who you will become tomorrow. If you work hard now you will be given opportunities in the future. You might think that by making time to study extra hard for that History test or staying during double to work with Mrs. Johnston on your math homework is only affecting your grade or your performance in class right now. That’s not true. By putting in the extra effort you are shaping your personality and who you are as a student. You are showing your dedication to actually understanding the classwork, not just getting the best grade. You are becoming a role model for your peers. Your actions are saying, “I value education.” Imagine what a classroom would look like if every student gave 110% all the time. By going the extra mile now you are setting yourself up for a bright future. I spent two years working in the Admission office at St. Mike’s. I interviewed high school seniors interested in attending college, read their essays and recommendation letters, and made the decisions as to whether or not we would offer them acceptance to the college. Who was accepted? The students who clearly had worked hard. That doesn’t mean that they didn’t struggle from time to time. Working hard means to be focused. It means that at any given moment you are doing what is important. Working hard means to go the extra step. It means revising your essay or redoing your homework when you are given the opportunity – not just for a better grade but so you learn from your mistakes. Now don’t tell my boss, but I am going to give you three insider tips for getting into college. Your senior year grades are the most important of them all. If you are an athlete looking to play basketball in college… would you quit the team senior year? That just doesn’t make sense! Senior year is the most important – you want to be a starter and make it to the Final Four and have college scouts recruit you. You are working hardest senior year. Think of academics in the same way. Senior year should be your most difficult year. Colleges want to see 4 years of math, science, and a foreign language on your transcript. Senior year is your final preparation for difficult college work. Study hard, don’t sit the bench. Your essay should be about you, not about your game-winning goal or a biography of a relative. Your essay is the one place in your entire college application where you have 800 words to say anything you want. The best essay I ever read was from a student who visited monks in Tibet, his experience interacting with their community and how fascinated he was by their lifestyle. The essay ended with a beautiful line about how the monk was actually more fascinated with the kid’s braces than anything else. A very unexpected ending to a beautiful story. What did it show me? That this student appreciated a global society, other cultures, and had a great sense of humor. How could I not want a student like that at St. Michael’s? High school is the time to find your passion – whether it is playing the tuba, being a champion for clean energy, or volunteering your time to tutor elementary students. My mistake in high school was thinking I had to do everything in order to get into college. And that is just not true. Colleges want to see that you have pursued your passions versus signing up for French Club because you think it will look good on your application. And believe me. Colleges can tell the difference. Now since we have been talking about Facebook I am going to give you Bonus Tip #4. If you wouldn’t say it to Mrs. Andre (the principal), don’t write it online. Even if you delete a comment, it is never truly gone. The last thing you want to do is ruin all the hard work you’ve done academically in less than a second. Facebook, Myspace, Twitter – they are all vauable and powerful tools when used correctly. So to bring this full circle I want to get back at my question: How can you possibly prepare for something that doesn’t exist? I worked hard in high school to arrive at college where I had to work harder to do well academically and be recognized. I received a strong liberal arts education and had the opportunity to study at Oxford University, this has prepared me for my career not just my first job. And I worked hard in that place in order to enter the workforce when the economy slipped and jobs weren’t readily available. I looked for a job in an economy that told me I had to work even harder to get noticed. And so I did. And now I work in a position that was created for me because my work ethic, dedication, and academic success was recognized and appreciated. And now I am given the opportunity to speak at conferences all over the nation to people who are more than twice my age… and they regard me as an expert in my field. Why? Because I work hard and that started here at CCS where I learned the importance of scholarship, leadership, service to my community, the importance of character. I’m speaking to the best and the brightest that Chateaugay Central School has to offer. You should be very proud of yourselves. You are the academic leaders of this high school. What are you doing with that power? How are you making your high school and your community a better place? And don’t forget to think outside the box when it comes to your career. Most of you will work for a company or in a job that does not exist right now. Prepare yourself, give everything you do 100%, and next time your mom tells you to get off Facebook – just tell her you’re doing it for me. American Idol fever has hit the nation! New judges, new contestants, and new voices will entertain America for the next few months. You know, I’ve always thought it would be a good idea for them to bring back a past winner as a judge. Who knows what it takes to be an “American Idol” better than Carrie Underwood? But the judges can get the contestants only so far in this competition, because as we all know the key to Idol is that YOU will be able to vote for the winner. The last audition city will be aired this week and then those darling contestants will be off to Hollywood. Are your finger’s itching to call in and vote? You’ll have to wait a few more weeks. Why not vote for the next International Brand Master brought to you by the Educational Marketing Group? You have your esteemed panel of judges, of which I was humbled to be apart of, who selected from a list of 8 smart, experienced, creative, and talented nominees only 3 finalists. You can vote online and via twitter as many times as you want (but only once per day). No pesky 1.866 numbers here! Voting ends at 12:00 a.m. EST (midnight) on Friday February 18, 2011 and the winner will be announced Tuesday February 22, 2011. It has been an amazing and inspiring 3 days watching the higher ed community rally around Todd Sanders on his trip to Dallas via the Mercedes Benz tweet race. His team, #MBTeamS, has been crushing the competition. How did Todd and co-driver John Pederson get into this race? Why… by web video of course! And while they do get some great prizes if they win… what is even more important is that St. Jude’s can receive a very important donation of up to $50,000. I encourage you to consider donating to this worthy cause. Tim Nekritz wrote a great blog post yesterday titled: content + connectivity: analyzing the brand of @tsand – check it out. You can help keep the support going… the race is not yet over! Just start tweeting with the hashtag #mbteams and @tsand to earn fuel and points!